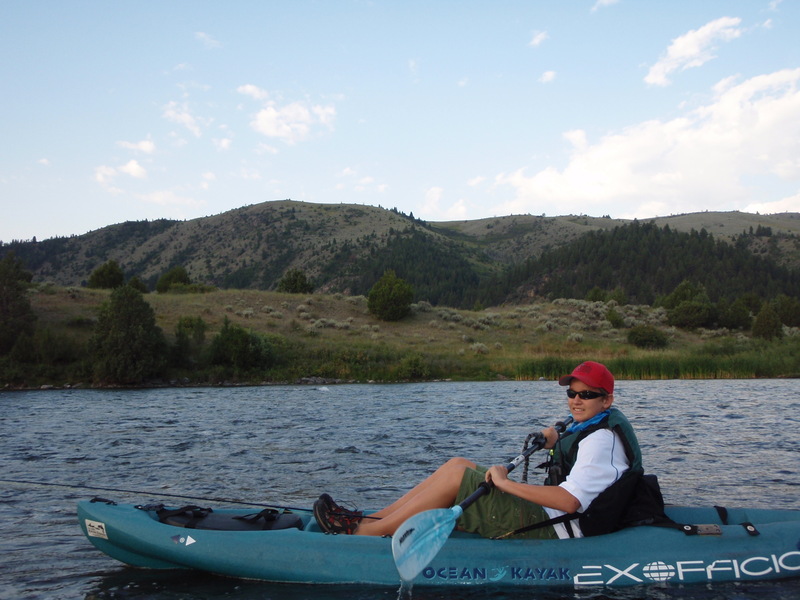 As a fishing guide, one of my greatest pleasures is watching a new kayak angler land their first “kayak fish”, that feeling is multiplied a hundred fold when it is one of my kids. I cannot begin to tell you how many times, after a day of hooking and handing off fish to my son, he has bragged to me that he out fished me and that he is a natural. I will never forget the time, during a trip to Punta Colorada, that my, then eight-year-old, son and I had a double hookup of Dorado from the kayak. I told him he was on his own on this one, and he handled the task like a pro. Yes, I was the proud father on that day. He is now 14 years old, taller than his dad and has become my favorite fishing partner and every once in a while he actually does outfish me. 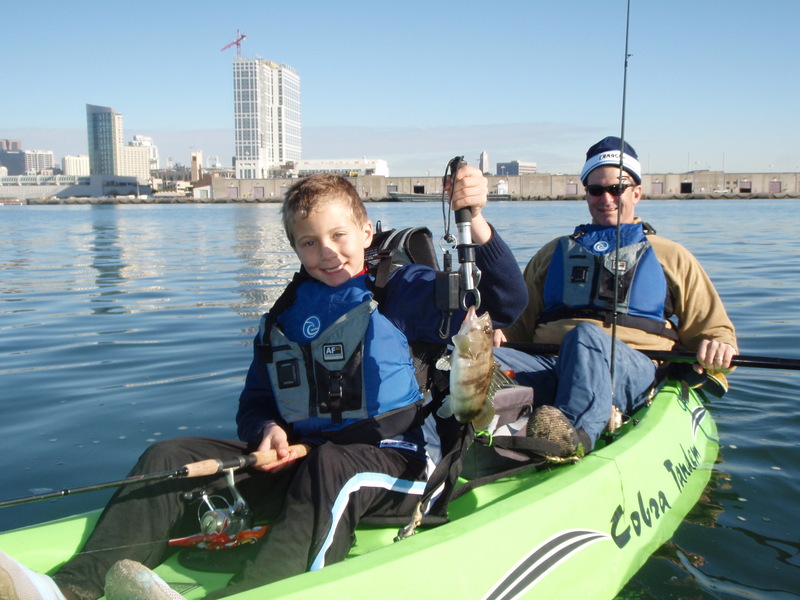 Until the child is old enough to handle a kayak on their own, with most kids that is between the ages 10 and 12, kayak fishing with a child is best done from a tandem kayak such as the Ocean Kayak Malibu II XL. These bigger kayaks will give you plenty of stability for those times when the child suddenly wants to reach for something floating in the water. In addition to the added stability, you will have plenty of room and a dedicated place for the child to sit. When my kids were small, I would turn the forward seat so that it was facing me. In this configuration, I could always see my child’s face, making it much easier to judge how they were doing. This setup also makes it easier for me to help them with a hooked fish or retying a jig. Going old school here, my daughter in the tankwell of my scupper pro. She is now 17. You should start by just taking the child for a short paddle on flat water such as the bay. Leave the rods at home; see if they enjoy being on the water. This first outing, if the water is warm enough, is also a good time to practice getting on and off the kayak in the open water. Try this first in water that is just deep enough for you to touch the bottom. If your kids are like mine, they will have a blast jumping off the kayak over and over again. This will lessen any worries they have about getting back on the kayak if they fall in. 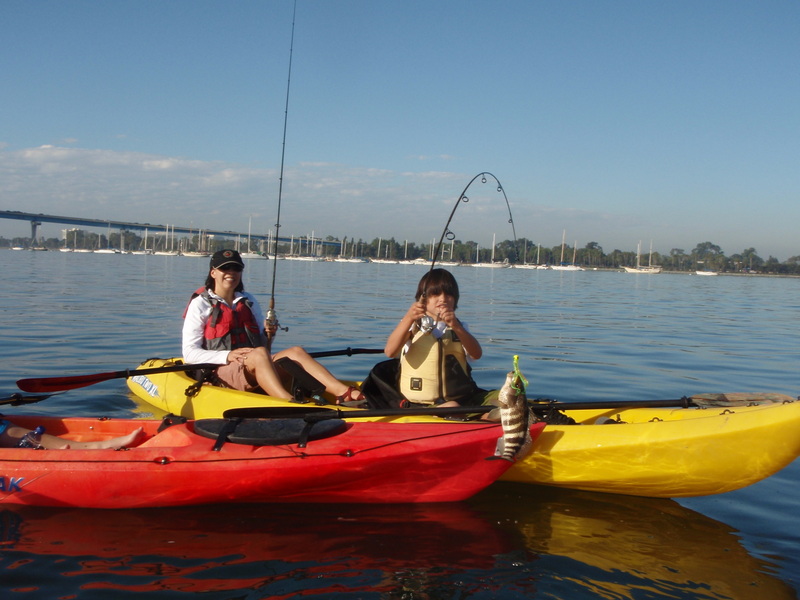 The adult should get back on the kayak first, so they can balance the kayak and assist the child to get back on. If available in your area paddle by one of the haul out buoys with the Sea lions on it, this is always a thrill for the kids. Do not forget that kids get bored fast so keep this outing short and entertaining. 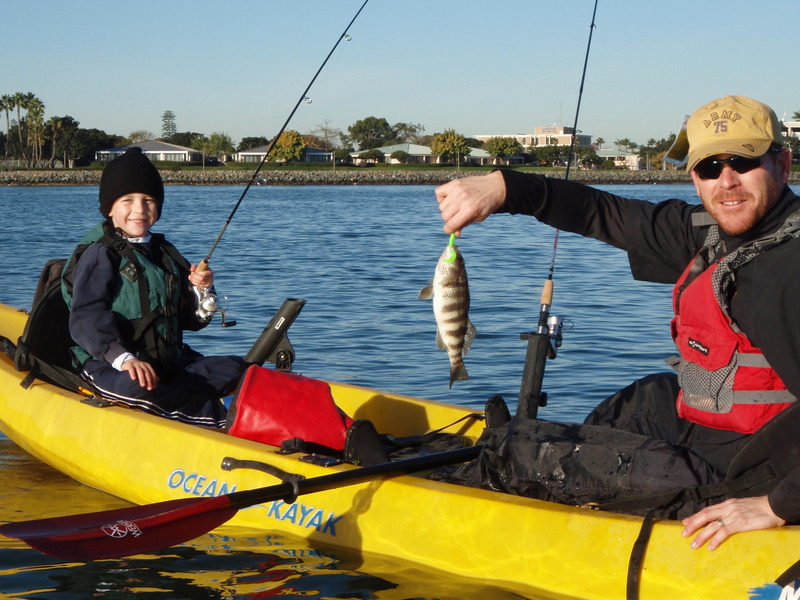 There are several reason we recommend starting out in the bay, you will get a better idea whether the child is comfortable on the kayak and there is a much lower chance of them getting seasick. 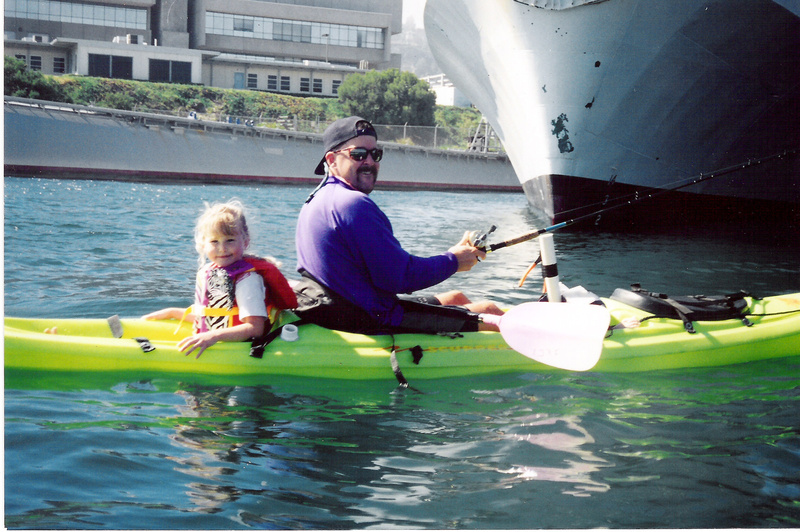 Yes, you can get seasick on a kayak and a seasick child is a miserable child. 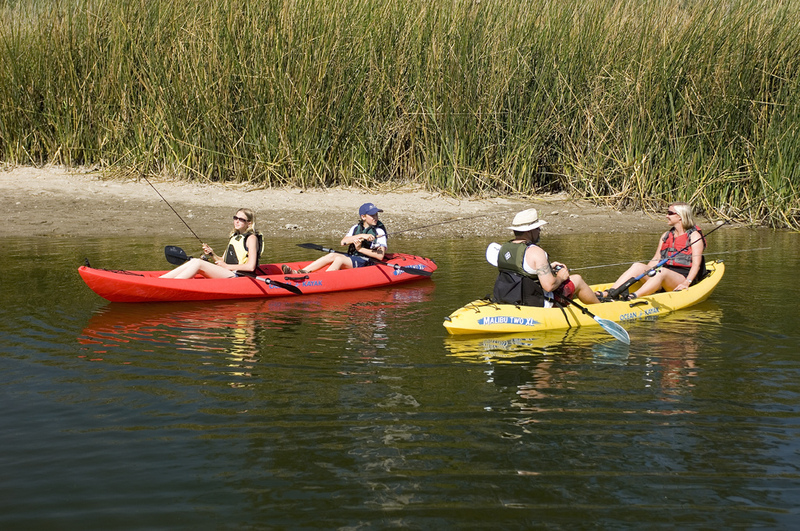 The surf zone can also be very intimidating for kids, and many adults, unless you are very proficient in the surf zone you risk dumping your kayak along with your child and gear into the drink. Another nice thing about fishing the bays is the ability to get off the kayak for a break. When out with my kids I try to break up the day by fishing for a couple of hours, then hitting the beach for lunch or just goofing off in the sand, then fishing another hour before heading home. You want your child to be comfortable while out on the water, a kid sitting in wet clothes is going to become cold and miserable in a hurry. Just like yourself, you need to dress your child appropriately for the conditions. Along with the required PFD (personal flotation device), putting your child in a small wetsuit will keep them warm all day. You can pick up a child size wetsuit from Costco for about $24, and kids love wetsuits. I always carry some extra clothes in a drybag in case my kids get too wet. A light windbreaker is always a good idea, even on the warmest days the wind can cool your child down in a hurry. Do not forget a hat and sunglasses as well as a lathering of sunscreen before you head out. It is a good idea to also bring along plenty of your kids favorite snacks and juices, it will just make the day feel that much more special. If the child is old enough to help paddle, that is great, they will really enjoy it and it will make them feel like they are helping with the work. If the child is going to help paddle, make the investment in a child’s size paddle. A child will struggle with a larger paddle and will become discouraged very quickly. Just as with any type of fishing with kids, the most important factor to remember is, this outing is about the kid catching fish not you. Most kids that are just being introduced to fishing will be happier catching ten Mackerel than they would trolling around all day hoping for a Yellowtail. 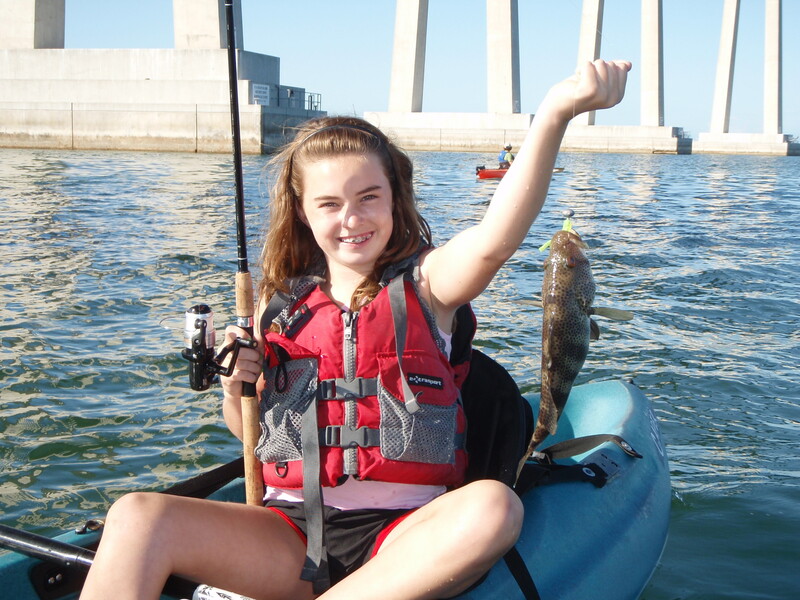 Again, the bays are a great place to start; you will have the opportunity to catch many fish to keep a smile on your kids face. 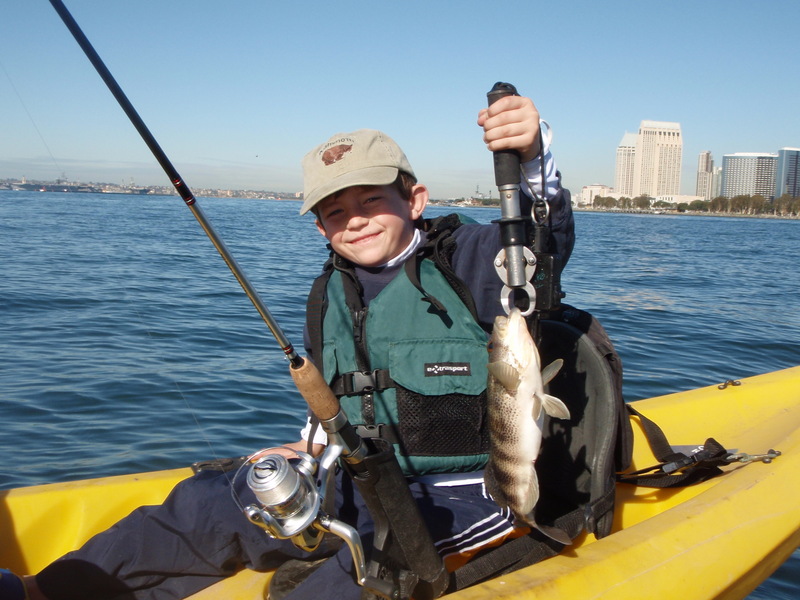 In our local bays, your child will have a chance to catch spotted bay bass, Sand bass, Halibut, Bonita, Mackerel, and many other species. Bring light tackle spinning or spin casting reels that are easy for the child to master, a bait caster in most kids hands is just asking for trouble. Though you want to use gear that is easy for the child to handle and not to expensive, I steer away from the low-end “kids” rods. These rods can actually cause more problems than they solve. I do think that the child should have their own rod for which they feel responsible; I always make sure the kids take part in the cleaning of the gear after the trip. I generally load the reels with six to eight pound test to entice more bites. Fishing the drift on the moving tide, with a small grub just bouncing on the bottom, keeps the casting to a minimum and will ensure many bites. You can add a small piece of squid to help entice more bites. Another good option is to setup near one of the bait barges, there are usually a good number of smelt, mackerel or small barracuda willing to bite and give your kid a great fight. For the smelt or Macs a small sabiki or bait catching rig works great, cut it down to two hooks to avoid problems and your child will have a blast catching fish all day. Keep another rod with a small crank bait, such as a Berkley Frenzy, handy. When you make a move, let the child hold the rod while you troll to the next spot. You will be amazed how many fish you can pick up this way. Teaching a child to fish can be a bit frustrating at times, I know that I have had times when it was announced “it is time to go home”, just as the fish are starting to bite. Remembering that the day is about hanging out with your kid and turning them onto a sport that you love, this means patience and sometimes sacrificing what you would like to be doing like staying on the water all day. 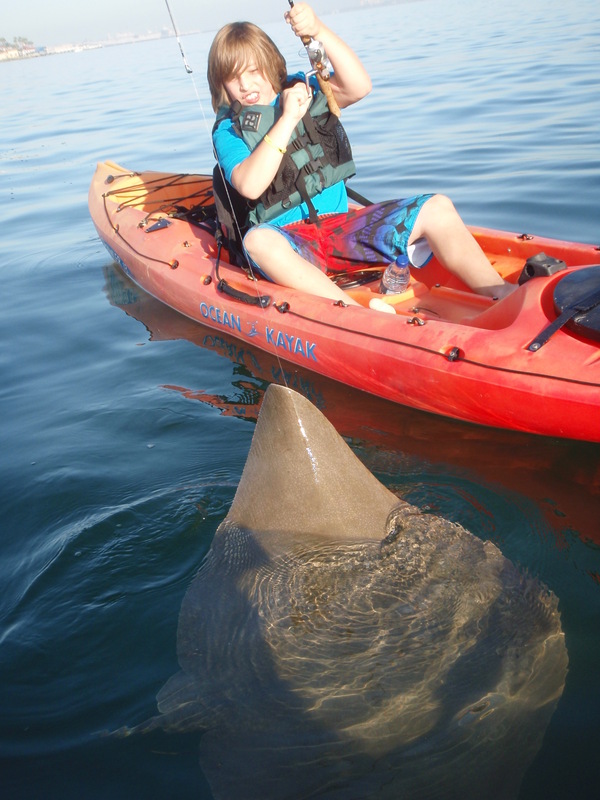 Sometimes the shortened trip will mean less hesitation the next time you want to take them out on the kayak. The rewards will be well worth it in the end when you find you have a fishing partner for life.